SEATTLE, WA: Stop "Ride the Ducks" and their un-safe utilization of public-launch for commerical purposes! Email: Send us your examples: feedback@stoptheducks.com. 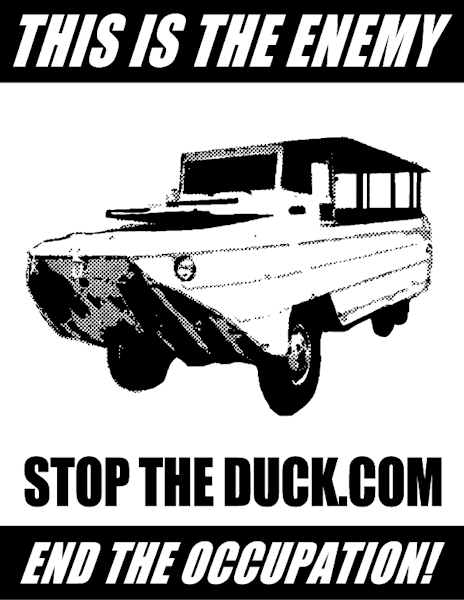 Facebook: Join us on Facebook and help Stop the Duck!. PDF Poster: PDF of a 8.5" x 11" Poster. PDF Stickers: PDF of 4 stickers with "Le Canard Non!". PDF Stickers: PDF of 5 Bumper-Stickers. GOAL: Revoke the License/Permission of commercial enterprises (Ride the Ducks) to use our Public Boat-Launch at Sunnyside. "Ride the Ducks" has 30 time-slots running from 9:30am until 7pm with 3+ boats (depending on interest) for Friday, Aug 20 2010. That equates to 180x in a given day that a duck-boat will be coming in/out of the water. This is an estimated to be TWO to FOUR TIMES the use of all other boaters. "Ride the Ducks" usage of the public dock 180 times in a given day with their 13,000 lbs (no passengers, 6.5 tons) drastically increases the wear on the public docks. In addition, the DUKW driver's responsibility to make internal company schedules causes unsafe conditions at the dock; as they squeeze between trailers to launch/retrieve. Someone's truck was "tapped" just last weekend. "Ride the Ducks" has even taken to staffing multiple personnel at the launch (as seen Aug 14/15) in order to coordinate the timely launch and retrieval of their boats... ahead of other boaters. It is our belief that "Ride the Ducks" should not be allowed to use the city's public launch facilities for their operation and the license/permission to do so should be immediately revoked for the safety and sanity of boaters using the Sunnyside Public Launch. Since "Ride the Ducks" is a private commercial company, their revenue is not published. The following is an estimate based on only operating ONE vehicle. Numbers below are estimated very low and actual figures could be 3-4 times as much. $4,000,000 ($4 million/year) "Ride the Ducks" is a multi-million dollar corporation, making an estimated $4 to $6 million/year. $18,500/day! In a single weekday, the DUKW boats operated by "RideTheDucksOfSeattle.com" can make up to $18,500.00 day!?!?!? Side Note: This does not take in account for MULTIPLE boats per 30 min interval, as we've seen at least 3 at the 7pm slot. JUST HOW MUCH MONEY ARE THEY MAKING USING THE PUBLIC DOCK?!? In Seattle, we are concerned about the safety and public nuisance caused by the DUKW boats that are operated in our city limits. As citizens of the City of Seattle, we would like to organize and affect changes necessary to ensure that these vehicles are operated in a safe and respectful manner in/on our city, streets, neighborhoods, lakes and docks. DUKW boats operated by "RideTheDucksOfSeattle.com" in an unsafe and/or public-nusiance manner, thereby affecting citizens of Seattle, public/private property and local noise ordiances. Aug 15th, 2010 at Sunnyside Public Launch:Two representatives of "RideTheDucksOfSeattle.com" were stationed at the public-launch to coordinate the entry/exit of DUKW boats at the Sunnyside Public Boat-Launch. When queried as to the reason, it was learned that a DUKW nearly collided with another citizen's vehicle as it used the launch. Aug 15th, 2010 on Lake UnionA DUKW boat from "RideTheDucksOfSeattle.com" nearly front-end collided with a small 14' sailboat on Lake Union. The driver of the DUKW was not attentitive to boat traffic ahead of the vehicle and his head/torso was turned to the back of the vehicle as he entertained the boat's patrons. The collision was adverted by the sailboat turning 180 degrees and the driver putting the boat in full-reverse. Aug 15th, 2010 at Sunnyside Public Launch: A group of 3 DUKW boats from "RideTheDucksOfSeattle.com" attempted to push past two vehicles as they launching/retrieving boats. Busy to make their tourist-schedule, the driver of the first DUKW asked over the P/A to one of the boaters: "How am I doing in the front there?" as he inched the DUKW within 6" of the truck. The driver said that he "did not feel it was safe, I've had already waited for 3 other DUKW boats and you will have wait like everyone else". At which point, the driver encouraged the passengers to berrate the driver as they waited for him to retrieve the boat.